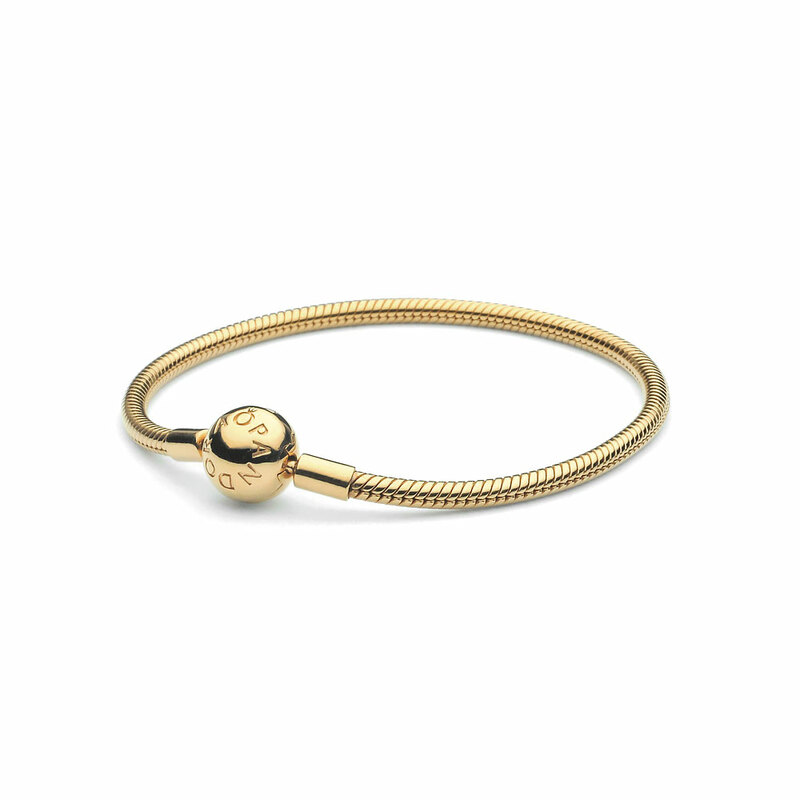 Add golden colour to your bracelet collection with this smooth PANDORA Shine charm bracelet in 18k gold-plated sterling silver. Wear it with other versions to mix your metals. Available online and in concept stores in size 15cm to 23cm. PANDORA Shine MOMENTS Smooth Bracelet is rated 4.2 out of 5 by 20. Rated 5 out of 5 by Cesca from Stunning!! I won this bracelet with the pandora competition, with the release of shine and absolutely love it. Rated 5 out of 5 by 57Redhead from A New Favorite I love this bracelet. You cannot tell that it is not a true gold bracelet. The bracelet fits right along with my other true gold jewelry. I will definitely be adding more Pandora Shine to my jewelry collection. Thank you Pandora. Rated 5 out of 5 by Mopo from Love it so much This is my first pandora bracelet, my husband ordered me one after finding out they had a gold one and our local store didn’t carry them because my wrist is so tiny! I’m not a fan of silver so this bracelet is great! It’s so pretty I’ve wanted a charm bracelet forever. I went out and bought two charms can’t wait to add more, didn’t know I needed pandora clips to keep the charms in place lol! Rated 5 out of 5 by Rezwana from Rezwana Got this bracelet along with many charms as a gift this year, since my parents know I love jewelry's. I love it all, though I do feel that the gold collection is more fragile and prone to scratches. I would not use the gold collection everyday, but they're great for occasional use. Rated 5 out of 5 by Kimothy27 from Love it as much as my silver Padora!!!! I have had my silver Pandora bracelets for years (one to wear all alone and one that has all my charms) and wanted a gold one. This gold tone one is perfect for everyday wear. I have only had it a few days, but I love it to wear with all my gold jewelry! !